Toward the end of the 4th century BCE, new shapes and materials were introduced to Greek jewelry. 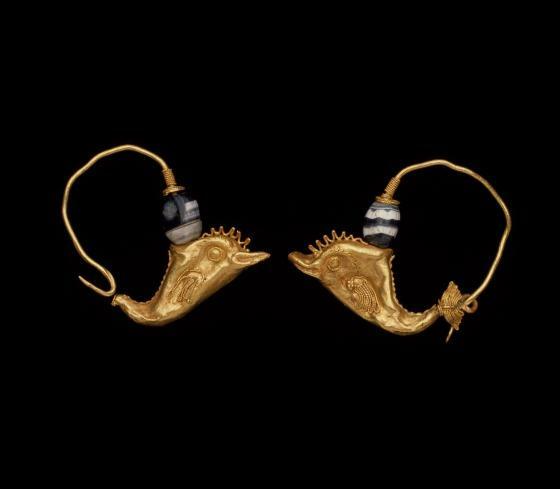 The most ingenious innovation of the Greek goldsmiths of this period is the animal-head earring: a tapering, penannular hoop made of twisted wire with one terminal and the larger end in the form of an animal's head. In this example, the bodies of the dolphins are hollow, made from two halves in sheet gold. The seam along the back of the body is turned into a notched ridge. The eyes and fins are indicated by twisted-wire filigree. A strip of sheet gold, serrated at one edge, forms an arch above the eye. An undulating gold wire is applied in a rectangle to the crest of the head. The tail fin, preserved only on one piece, is decorated with parallel lines of twisted wires. 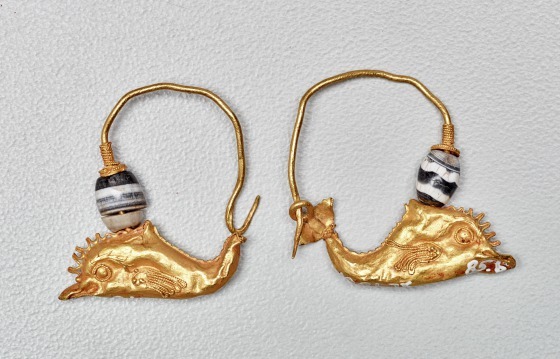 A strong gold ear wire, originating from the top of the dolphin's head, holds a globular, black-and-white banded-agate bead, a small disk with an edging of twisted wires, and a coil of fine twisted wires. The tapering end of the ear wire can be inserted into a loop attached to the back of the tail fin. The comparison with dolphin-shaped terminals of necklaces, found in graves in Taranto, suggests a date in the second to first century BCE and a south Italian origin. It has been assumed that this design derived from Etruscan lion-head earrings, represented by several examples seen in the collection of the Dallas Museum of Art (1991.75.27.a-b, 1991.75.28.a-b). 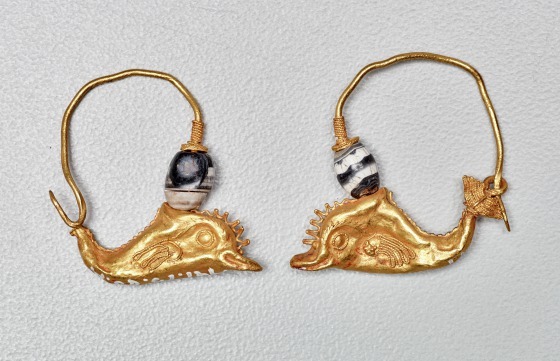 However, it is more likely that the animal-head earring type is a genuine Greek creation, inspired by a long-established type of Greek animal-head bracelets like a lion-headed bracelet (1991.75.52), also in our collection. Barbara Deppert-Lippitz, Ancient Gold Jewelry at the Dallas Museum of Art (Dallas: Dallas Museum of Art in association with the University of Washington Press, 1996), 62-63, 134.